Back in February, new reader Jeph let me know that he had had delicious success with my Cranberry Christmas Scones and Chocolate Biscotti. His colleagues, he reported, had gobbled them up. Now he was wondering if I happened to have a recipe for almond biscotti up my sleeve. I did not, but I had been wanting to write about something sweet, I adore biscotti, and I was inspired by his request. So I made one up. The first batch was flawless.The dough was easy to work with, the slices cut without breaking apart, and the finished cookies baked to an even perfection. They had a nice, slightly soft crunch (if that makes sense), yet held up to dunking. This totally new creation fell together so easily that, although I took notes, I didn't pay too much attention to exactly what I was doing. Which was fine because I immediately dismissed them as slightly blah, a bit on the boring side, definitely not sweet enough, and pointedly moved on. Four more batches of biscotti later, I realized I was heading straight into another Pita Project. Fortunately that was when I ran out of almonds and sugar. It was also when I realized that the original batch I had been comparison nibbling over the last five days was, in fact, quite tasty. All I needed to do was to recreate it. Several more batches of biscotti later. . . Along the way, I learned some things. —If you desire a fool-proof, totally stress-free biscotti baking experience, stick to my Chocolate Biscotti For Beginners. —If you use semi-sweet chocolate chips in your biscotti batter, they will melt during the first bake and make a big mess when you go to do your slicing. Dark chocolate (bittersweet) chips work well (and the ones I used were smaller than the standard semi-sweet chips, which was nice). Mini semi-sweet chocolate chips work well. Bittersweet/Dark chocolate chunks might work, but I haven't tried using them. —Biscotti are, by definition, dry cookies. By baking them twice, you are essentially drying them out. The dryness is what gives them their distinctive crunch (and longer shelf life than softer cookies). But weather, humidity, type of flour, size of eggs, and, quite possibly, the alignment of the planets all contribute to the "wetness" of your batter. So even if you are carefully weighing your ingredients, different batches of batter are going to require slightly different "drying" (baking) times. Also, everyone has a different opinion as to just how dry biscotti should be. All of this can be rather exasperating. —If your cooled biscotti are not crisp enough for your (or someone else's) liking, simply stick them back in the oven for a while. —If you add just one extra half cup of sugar to this recipe, you will end up with completely different cookies. They will be sweeter, but they will also be much crunchier. And they will require a longer second bake. If you are a fan of break-your-teeth-crunchy biscotti, this version might very well be your dream cookie, and you should probably try it. But you are responsible for all baking times and dental work. This is is a pleasant, all around, not particularly sweet biscotti that lasts for several days and improves with age. (It also freezes well.) It holds up to dunking but is also yummy by itself. In my opinion, it goes well with everything from a cup of hot coffee to a cold glass of champagne. If you're craving a sweeter (or fancier) dessert, you could dip one side of each piece in melted chocolate. Or you could dunk your biscotti in amaretto. Or you could break up a few pieces and stir them into some very nice ice cream and drizzle it with chocolate sauce or amaretto. The possibilities, really, are endless. The egg white glaze is totally optional but does give the tops of the biscotti a very nice shine. 1. Heat oven to 350°F. Toast almonds and let cool. 2. Place butter, sugar, eggs, and extracts in a bowl and beat until well blended (I use an electric hand mixer on medium for about one minute). 3. Beat in flour, baking powder, and salt and mix just until dough forms. Stir in almonds and chocolate chips. Dough will be stiff. 4. Divide dough in half and pat each half into a 3" x 9" flat log. Brush with egg glaze if desired. 5. Bake logs on a greased or parchment lined heavy duty baking sheet for 30 to 35 minutes, until golden brown and just beginning to crack on top. Reduce oven to 300°F. 6. Let cool 15 mintues (or longer) and slice into 1/2-inch slices (I use a large serrated knife). 8. Store in an airtight container up to several days or freeze. Flavors improve with age. © Copyright FarmgirlFare.com, the sugar and sweet foodie farm blog where Farmgirl Susan shares recipes, stories, and photos from her crazy country life on 240 remote Missouri acres—and we sometimes start the day by eating cookies for breakfast—with a nice big glass of milk to make them healthy of course. Does 'anonymous' ever read this blog? Duh!? Hey FG, I share the other sentiments re the troubled last few days - hang in there. Hugs from across the pond. The photos looks awesome too! Nice looking biscotti. I was making chocolate and almond biscotti around Christmas and I ran out of almonds (poor planning) and the only thing I had was pistachios. Long story short, the family got the 4 batches of chocolate/almond, but the fantasitic chocolate/pistachio I kept for myself. 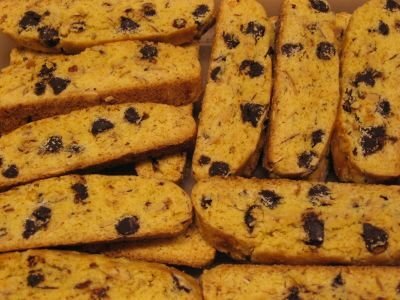 I know what I'm doing tomorrow.....baking some of these biscotti. After a stressful 6-day work week, baking is just what I need on my one day off before I head back to work on Monday. Wow, I am really loving this recipe. Excellent! Thank you! My gosh, you must be an awesome cook. Those are beautiful! I am going to try this recipe and make them for my kiddos. I am with Beverley on this... does "anonymous" read the blog daily? yeash.... Is it those comments that caused you to start moderating the comment section? Anyway, looks like another fantastic recipe to add to the growing collection of "not enough time or tummy for all these recipes" cookbook.... Though I do trust your judgement and will try them soon. Thank you for posting this recipe. I haven't tried making biscotti yet, and I think your recipe will be my first attempt. Making these now, can't wait to taste them! 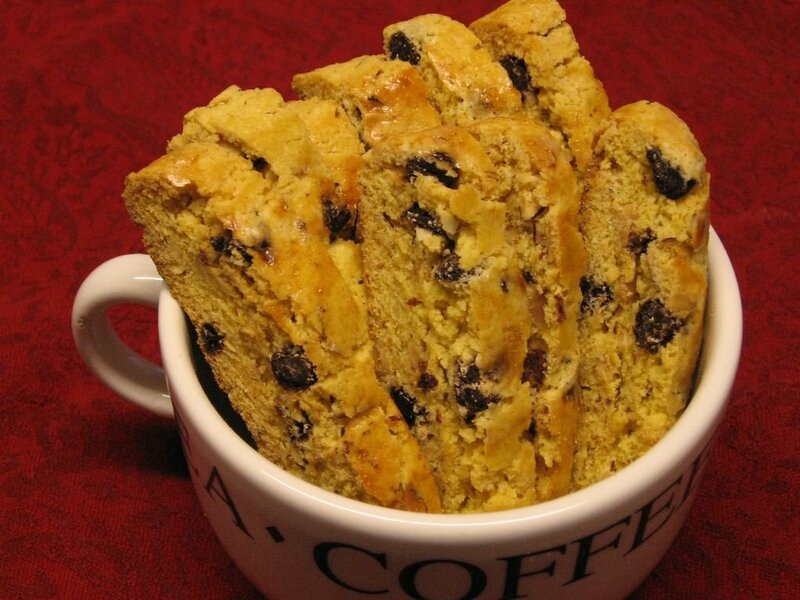 I make biscotti a lot but it's fun to check out other recipes too. Didn't have almond extract so used extra vanilla. Also added some softly dried bing cherries. Perhaps I had cantucci on the brain!